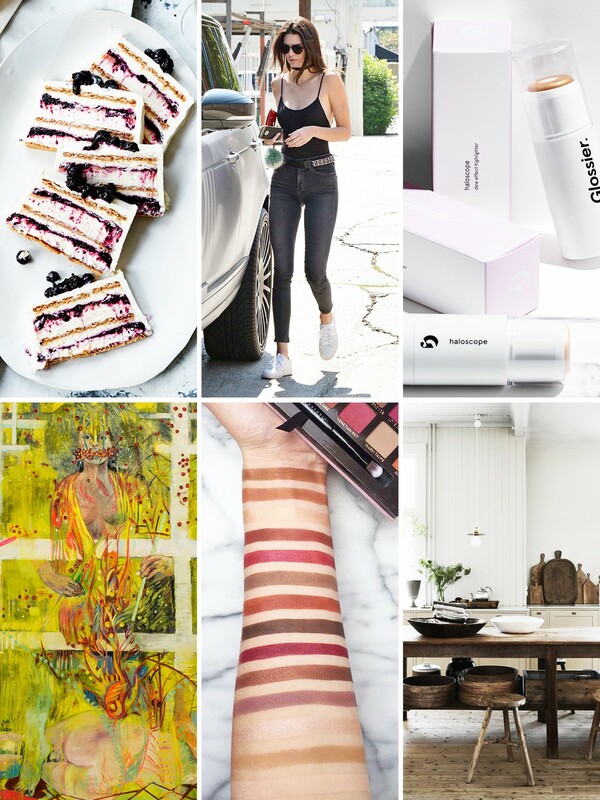 a few of the many things I am loving this week . . .
1. This Blueberry-Lemon Icebox Cake recipe from the amazing people at Bon Appétit. Yum! 2. Kendall Jenner's simple but ultra chic outfit while she was out in West Hollywood on Tuesday, June 07, 2016. Get the look: Only Hearts Second Skins Bodysuit, Are You Am I Rosalie Velvet Choker, Citizens of Humanity Rocket High Rise Jeans in Decibel, Elizabeth and James Watts Sunglasses in Black/Silver Mirror Lens, Louis Vuitton Key Pouch in Cherry Monogram Vernis with Fendi Pompom Bag Charm and Kenneth Cole Kam Sneakers. 3. Glossier's 'Haloscope' highlighter! Available in two gorgeous shades – quartz and topaz, this genuine crystal extract infused highlighter also contains a solid oil core of vitamin-rich moisturizers for a hydrated, dewy finish. If you're in the hunt for a new highlighter that's not dry and doesn't have chunks of glitter – this one is the perfect highlighting product for you. 4. New York city based figurative painter Marie Peter-Toltz's paintings which explores femininity and creative identity. You can see more of her works on her website and Instagram account. 5. All the neutral and berry tones from the new Anastasia Beverly Hills Modern Renaissance Palette. I don't know about you guys but for me, I think that this eyeshadow palette is a definite must-have. From the packaging to the shades – everything is just so on point. 6. Inredningsmeckat Artillery founder Christian Duivenvoorden and his husband Björn's gorgeous Gothenburg home.